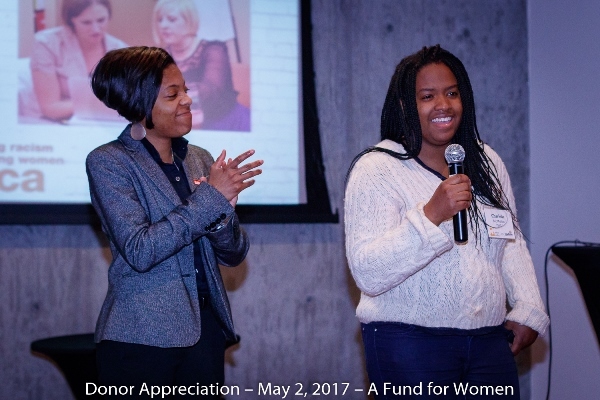 On May 2, 2017, A Fund for Women had the pleasure of celebrating those who donate their time, talent, and treasure to the organization. More than 60 people attended the event held at HotelRED. After conversation and sampling delicious snacks (ooh, those mini cupcakes! ), attendees listened to the inspiring words of individuals whose lives A Fund for Women has touched. YWCA Interim Director Vanessa McDowell introduced Charielle McMullan, who spoke about her experience in the YWCA Madison's Women in YWeb Career Academy. She learned website development and also built her job readiness skills. “I was able to get an internship that turned into a full-time role. At a time when I was struggling with getting and keeping housing, the program gave me something to work toward. 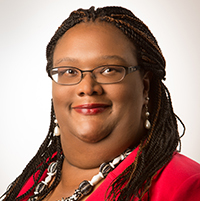 I persevered because of the support I received from the staff and my peers in the program,” Charielle said. She now has access to a network of local tech professionals to help her build her career. Nina Gehan and Tania Rivera shared their experience in the CAMINOS Career Pathways Bank Teller Training Program. The Centro Hispano of Dane County program for bilingual Latinos teaches customer service, banking best practices, and financial protocols that prepare participants to begin a career in the world of finance. Tania gave her first speech in English. 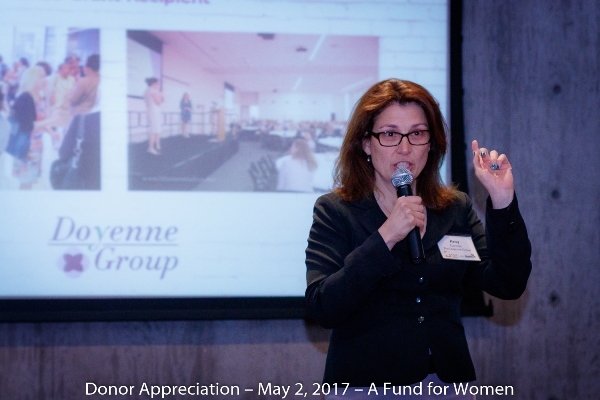 Amy Gannon, co-founder of Doyenne Group and 2016 grant recipient, shared why an entrepreneur fund for women is important for our community. Doyenne Group founder Amy Gannon energetically described her work developing this entrepreneurial resource designed to financially support the launch, growth, and sustainability of businesses owned by women and people of color. A Fund for Women has invested in the Doyenne Group’s Evergreen Fund. On behalf of A Fund for Women, Nicole Jenkins, Chair of the Advisory Committee, thanked attendees for their support and shared a moving personal story about what inspires her to volunteer so generously with A Fund for Women. Closing with a shout-out to the staff and board of Madison Community Foundation, of which our fund is a Giving Partner, Nicole introduced Development Director Angela Davis. Angela’s words underlined our mission to transform our community so women and girls thrive. She gave an update on the Earn-Save-Invest Initiative, which is informing a strategy map to guide the fund in the future, and recognized Summit Credit Union for their financial support of ESI. Because of what was learned in that initiative, A Fund for Women’s grant focus will continue to be women’s economic empowerment. Jenny Seeker-Conroy, Chair-Elect of the Advisory Committee, closed the evening with a round of thanks and a reminder about the upcoming 2017 grant cycle. 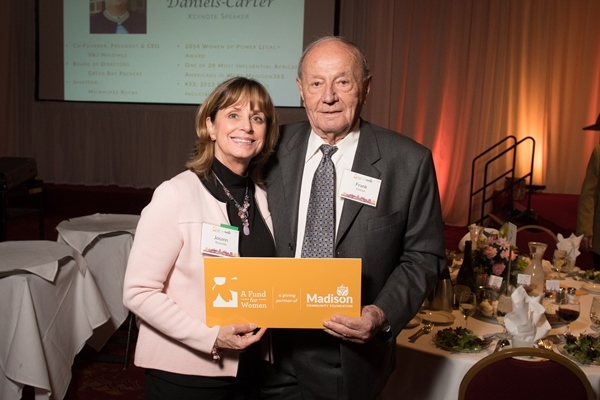 The Honorable Josann Reynolds and donor Frank Gietzel at A Fund for Women's 2016 Annual Dinner, Imagine Madison. In Fall 2016 a remarkable man did a remarkable thing—he opened a new unrestricted fund with A Fund for Women, a giving partner of Madison Community Foundation. Franklin Gietzel invested $175,000 in the wellbeing of Madison area women and girls. His generosity demonstrates that men, too, find it important to support A Fund for Women. Frank first learned about A Fund for Women when his nephew’s wife, Jan Gietzel, was the fund’s Executive Director. “I was impressed with the work of the fund and how it helped women,” he said. Frank had, early in his 95 years, witnessed economic need first-hand. His mother became a widow just two days after Frank was born—leaving her with five children. She remarried and went on to have seven more children. As family farmers during the Great Depression, things got so tight that Frank and some of his siblings had to live with neighboring farmers to provide labor in exchange for food and shelter. Frank struck out from home after eighth grade, heading south and working on farms. He came home at the end of the season with 36 silver dollars in his pocket. He was rich. Frank made his way into Air Force Officer Training School in spite of his lack of education, serving as a fighter pilot for 27 years spanning World War II, Korea, and Vietnam. An annuity that was reaching maturity led to his gift to A Fund for Women, which shifted what would have been a taxable capital gain to a tax-exempt charitable donation. We are deeply grateful for Frank’s support of our mission to transform our community so women and girls thrive.